News spread quickly and the man heard it: Jesus is here! He’s back in Capernaum. Reclining every day of his life, this man lay flat out on his mat, the mat of his past, present, and future. Paralysis had not only left this man’s body atrophied but also left his soul feeble. Tired of his immobilized, horizontal mat-life, tired of the bedsores, tired of his burdens, tired of focusing on the ceiling and feet…he wanted to see the Healer. In the flesh. Jesus had healed others on previous trips to Capernaum, so maybe this would be the time He would heal Mat Man. “Get me to the house!” the man urged his four faithful friends. So, they picked him up with his mat and headed for the house where Jesus was staying. When they got there, visitors overflowed out the door. The only route left to the four men was up. 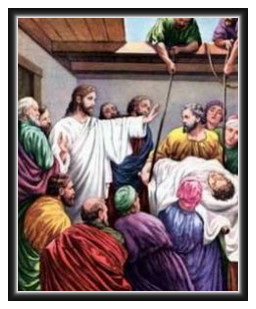 Once on the roof, they began taking apart the roof to make an opening and then lowered Mat Man down in the presence of Jesus, coming to rest at His feet. So, “the man jumped up, grabbed his mat, and walked out through the stunned onlookers.” (Mark 2:12a NLT) Healed! Burdens gone. Illness gone. Past gone. No more feeble, shaky legs. No more depending on others. No more lying down on his past. Standing upright, he walked out carrying his mat of horizontal existence, his mat of disease and depression. He was free! What about me? What about you? Do we live horizontal, immobilized lives…in our hearts? If so, it can sometimes affect our physical condition. But what about the spiritual side? What causes us to live horizontal mat-lives? *Unconfessed sin? Fear? Doubt? Worry? Addictions? Grief? Loss? Unforgiveness or bitterness? Negative attitude? Depression? Discouragement? Dwelling on our past? Does any of that cause you to have a mat-life? If I’m not diligent to guard my heart, I know just where to lie down on that stinkin’ mat! If I wrap my fingers around any of these things, or others, and cling to them, I throw out the mat of paralysis and park myself on it. Ah, yes. That Perfect Peace. When I draw near to the Lord, sitting at the feet of the Healer of all ills, I find the sweetness of His Life poured out into mine…forgiveness and fullness of joy, strength and peace, comfort and rest, faith and hope. Whose feet are you focused on? When I focus on my circumstances or look backward to where I’ve come; I get discouraged. And that’s what the enemy loves. So, I come before the Lord and tell Him all that I feel even though He already knows. I ask Him for His direction as I don’t have all the answers that’s for sure. And I long to simply abide in Him as that is where I find my strength and shelter from the storm. He leads me and provides me with all I need to navigate during this difficult time. I don’t want to be stuck lying on my mat but instead to use my response to each trial to glorify Him. Amen, amen, amen! Such truth, Debbie! And I know for a fact that the Lord is being glorified through you. You are a precious soul! Blessings to you, sweetie! Love you! Got me thinking. Thank you. Blessed are the feet who spread the good news. Alisa, I’m so glad you stopped by. My prayer is that the Lord always has special hearts picked out to visit. Thanks so much for commenting. Blessings to you! Rebecca, Thank you so much. You bless me! Blessings to you! Hey, Sheila! So good to see you! Thanks so much for stopping by and commenting. Love hearing from you. Be blessed! I love the way you Lynnified the account of “Mat Man” and, as you always do so beautifully, aimed a lesson at us through it. Thank you for so faithfully being an instrument to deliver God’s messages to us, your readers! Praying to always live an upright life focused on Jesus. Thanks so much, sweet Connie! You always bless me with your kind words! Love you!